This is a weekly meme hosted by Jill from Breaking the Spine. "Waiting on Wednesday" spotlights upcoming releases that we're eagerly anticipating. 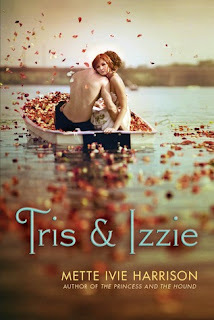 Goodreads says, "A modern retelling of the German legend "Tristan and Isolde", "Tris and Izzy", is about a young witch named Izzie who is dating Mark King, the captain of the basketball team and thinks her life is going swimmingly well. Until-- she makes a love potion for her best friend Brangane and then ends up taking it herself accidentally, and falling in love with Tristan, the new guy at school. Light, contemporary romantic fantasy for teens." *I adore the story of Tristan and Isolde, so my interest was definitely peaked by this modern retelling. I think it sounds fun and hopefully will lend some attention to the original story. And I can't deny how fabulous and eye catching this cover is?! Incredible! I think this will be a fantastic book. I kind of hope it has a happier ending than the original though! I love this tragic couple & cover :) great pick! This one sounds really interesting. And the cover is so different from the norm. This one is pretty popular this week :) Hope you enjoy it when it comes out! Agreed! This one looks/sounds fantastic! Wow! I am so adding this one to my list! LOVE the cover and I love that it's based on tristan and isolde. Thanks for sharing! I am sooooo excited about this one too! I fell in love with Tristan & Isolde freshman year of college - I was taking "Love, Honour & Chivalry" and lost my heart ... Totally excited about A] a new story and B] it being a contemporary revision! I love re-tellings of classic stories - I'm going to put this one on my TBR list. Me too Christina! I just recently found this book and I can't wait to read it, Tristan and Isolde is a favorite of mine:) Love it! I just found out about this book like last week and instantly added it...That cover is gorgeous! Another tragic love story? Geez, get the kleenex! This is one that I'm also waiting on. Great pick!! Oh I am so adding this to my goodreads. Fab pick!!! Thanks for visiting my WoW, everyone! Happy Reading! I have this book on my tbr/wish list on Goodreads. The cover is beautiful! I can't wait to read this, either, because I love Tristan & Isolde's story. They are one of my favorite tragic couples. i love the reinvention of this story. sounds wonderful!